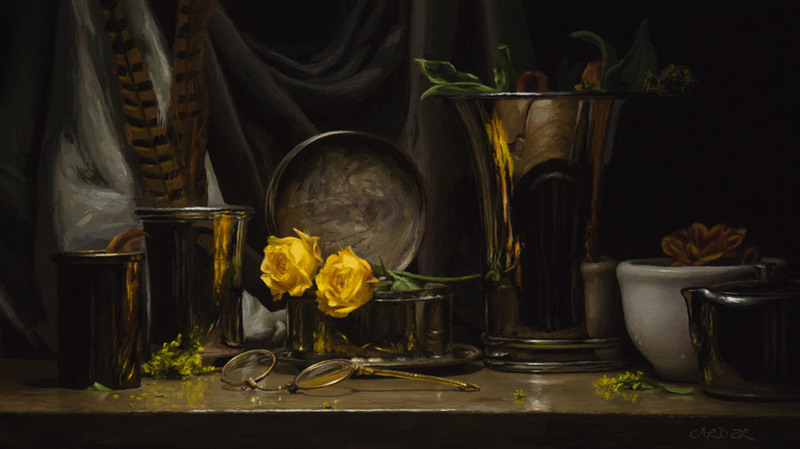 An online course for learning to paint realism in oil with free videos by Mark Carder, an artists' discussion forum, and more. How do you light paintings in the home? How do I make Geneva Paint more transparent, or thicker if I want to paint in an impasto style like Van Gogh? Why does it matter what type of canvas I use? What type of varnish should I use, removable or permanent? How long should I wait before varnishing? Should I stain my canvas even if I am going to be painting white roses? What type of brushes and how many brushes do I need to start portrait painting? I know you can generally mix any color with a limited palette like the Geneva Essential Palette, but would you discourage mixing Geneva paints with other brands? For example, can I use a pre-mixed tube of Payne's Gray? Can I use baby oil as a brush dip? What do you think about studying anatomy to help with illustrating a particular scene? If I am using Geneva paints, what medium should I use to adhere to the "fat over lean" rule? Cadmium Yellow is so costly. Why not use lemon yellow or something similar? Do you think certain colors are easier to paint than others? I find it hard to see details when painting really dark colors and even more when trying to add highlights to dark colors. Why do you usually light your still-life setups from above rather than from the side? And do you ever use gallery wrap? What are your framing preferences? Should an oil painting be displayed before it has been varnished? Do you clean the surface of your painting between sessions? Also, do you have any tips for avoiding dusts getting stuck into your painting? I am sensitive to smells so I love the sound of the solvent-free paint. Are Geneva paints non-toxic? When using a photo as a painting source, is it better to have a color photograph or a black-and-white photograph? How important is it to use the quick-dry white? Would a regular titanium or zinc white work for staining? How do you go about varnishing a painting if you send a portrait to a customer? Have them varnish it? Ship it back to you when it's ready to be varnished? What are your thoughts on different palette types? Do you use paint thinner at any point in your paintings? In the underpainting for example? You refer to the color checker and proportional divider as learning tools first and foremost, but I saw in your "Maintaining the Abstraction" video that you still premix plenty of paint to work with. I used to think I understood color enough that I didn't need to premix, but after watching your videos, I started premixing more and it saves time in the end. Do you normally premix even when painting for yourself and not demoing? Do you think painting loosely surrounding the focal point is a learned attribute, and should a painter seeking to be better at realism first learn to paint without this abstraction? Which solvent would you recommend to rework an area that is dry without damaging the canvas? Some colors, like Winsor & Newton's Terre Verte don't hold their body when medium is added and become too transparent. What are your thoughts on this issue? You teach drawing using a proportional divider, but other methods includes the use of grids, projectors, and optical devices like a camera obscura. What are your thoughts on these methods? Is it "cheating"? How do I learn more about painting backgrounds? A poorly chosen or poorly painted background can ruin an otherwise good painting. As a left-hander, I've occasionally blocked in using my right hand, finding it looser and more accurate than left-hand blocking. Have you ever tried painting left-handed? In your "how to set up a still life" video you talk about taking a bunch of "junk" and just putting it in a shadow box at random until you arrive at a grouping you like. What are your thoughts on starting with things that have some relationship to one another? Why is it called "Geneva" Artists' Oil Color? How do you sign your paintings? Do you add any other info to the back? Sometimes I have difficulty getting in "the zone" when starting artwork. Do you have any warm ups you do before starting a painting? I use Winsor & Newton oil paint and after I finish a painting and it dries for several weeks, I can see shiny areas and dull areas. Does this happen with Geneva paint too, and can I mix Geneva paint and Winsor & Newton paint together on my palette and on my canvas? Do you usually work in a completely black studio like in your videos? Is it necessary? I think I would prefer a happier, bright, cheery studio, but I understand there might be glare issues. Can you talk more about that? It is easy to copy life itself on a canvas after years of practice, but how does one see value and color when copying from their imagination? When you are painting, how do you when you are "done"? a talk about the myth of "natural talent"
Could you talk about "maintaining the abstraction" and how to avoid oversimplifying what we see when painting? Most of your videos show you painting with a small size 2 brush. What are your thoughts on bigger brushes? When creating photo prints to paint from, what type of lamination do you use, and what do you recommend for subject matter, lighting, type of camera, resolution, etc? Many artists use mirrors located about a room's length behind them when painting. Have you ever done this? You said "I've learned to take criticism"… can you expand on that? How do you clean Geneva paint from your brushes when you're done painting for the day? How do you restore brushes with wayward bristles? Do you always mix your own black with burnt umber and ultramarine? If your printer can make certain colors that you can't match with your palette, why not use a CMYK palette instead of an RYB palette? I am trying to achieve a more painterly look but when I do that my paintings come out worse than when I am just copying a photograph in a very precise and realistic way. How can I learn to paint more like Sargent, Sorolla, etc? Copying the masters? Could you do a demonstration of a seascape or paint water? After you have mixed up so many steps and are ready to paint, how do you remember where each step originated from in the source material? What do you think your career would have been if you hadn't chosen to be an artist? Could you please do a short video on how to check colors on laminated photos? If I discover a flaw in my drawing after my painting is mostly finished, how do I remove paint in that area, and can I just paint over a portion of the painting? What is most important, independent of the style of a painting: values, proportion, or edges? I am working from life and having trouble matching colours in very small spots in a still life. Please help me, I am really stuck! How did artists produce what you call "museum quality light" in the days before electricity? I'm a student at the University of Houston and the ventilation in our facilities does not allow for us to use regular oil paints, just water-mixable oils. Can I use the Geneva palette without ventilation, and if not, what are some colors from other manufacturers that are comparable to the Geneva colors? I like to do paint fine detail work and was wondering if I should make braced hardwood panels for their smooth surface, or should I stretch some fine tooth canvas? Can you talk about painting details? Like the peel of an orange? Do you use a small brush for that? In your video "How to Mix Colors with Oil Paint" you start with the darkest color and work your way up to the lightest color. In college my teachers told me to do the opposite. Can you elaborate on what you start with the darkest black first? Can I stain canvas for later use? Or is it better to just stain the one canvas I know I am going to use? On the Geneva Color Checker, why is the area where the paint goes tilted instead of perpendicular like the canvas? What is the difference between your color-mixing process in the "Poodle Head" painting demo and the process you teach students? When mixing colors from life, if you change the color of the light on the subject, how will this affect how the piece shows under other lighting conditions? Is Geneva Artists' Oil Color odorless? Can it be used to paint indoors without ventilation? In your "Making a Shadow Box" video, is there light in the light box on top, or does it work by indirect lighting? How do you know what is the right exposure when taking photographs? How does one figure what size to canvas to use when painting from life? When will the Geneva palettes be ready and what will the dimensions be? Could one use a mirror with a color checker to match colors of a sunset en plein air? Does Geneva paint get darker when it dries? What are the pros and cons of using a limited palette when painting flesh tones? a lesson about misconceptions about value in paintings, specifically the overall "exposure" and what happens to colors that are "overexposed"
Do you feel that artists like Sargent and Repin, who painted quite loose, worked more rapidly than you? I paint full-time and have pain and swelling in my hand after long days of work. This this normal? Do you have any tips on how to avoid this? Have you found a certain size painting sells better than another? Do galleries tend to prefer larger pieces to showcase? My studio has a very low ceiling, so my light is coming from behind my right shoulder. What do you suggest? What are your thoughts about color charts? Are they really useful or can I match my color by using just the color checker? Do you have any tips for maintaining the exact same viewing position when painting objects such as glass with reflections and other colors that can change? Do you frame your work or leave it unframed, and in your experience does it make a difference in the selling price? In your video "How to Mix Colors" you talk about mixing "good steps". Do you stop making steps when you determine you have covered the full value range? What do you think about lead-based white paint like Cremnitz or flake white? I heard that lead paint is better for flesh tones because it's transparent. I know Geneva paint is already mixed with the correct amount of medium, but what would you suggest if I want to paint a thin under-layer? How do you feel about the word "talent? I prefer the word "skilled". How many paintings should I bring with me when I talk to a gallery owner about a show? I live in a rural area with an art community. How do I find a mentor, or other artists who can give advice and critiques? Have you painted any self-portraits? 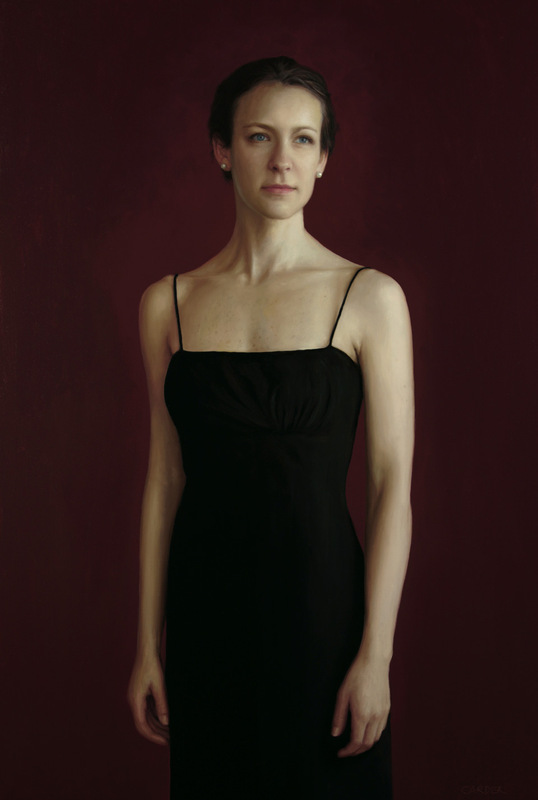 Would you suggest using a mirror or a photo when painting a self-portrait? 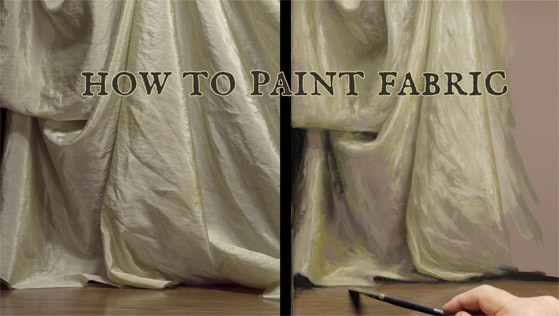 Do you have a video on how to paint from start to finish that covers the basics of painting? I struggle with getting my values right and am using white palettes. Should I invest in a neutral palette? I tend to try too many styles and techniques. Have you ever had this problem? How far should one sit from their shadow box? Subject matter is very important for realism but it hard to find something inspiring and interesting. What are your suggestions? What size photos do you use when painting portraits? What do you think about impressionism and painters like Monet? Have you tried painting en plein air with the color checker? Your five-color limited palette allows to you paint 99% of the colors you see in real life, but you avoid overpowering colors like cadmium red. Thomas Baker is another great artist on YouTube and he uses strong colors in his limited palette. What is the advantage to using one palette over the other? Can the Geneva palette be used to mix very dark black skin? And can you upload more of your paintings online? Why do you stain your canvas with fast-drying white and burnt umber instead of using a turpentine wash? Is there any significance to the position of the white and brown on your color wheel? What do you think of Leonardo da Vinci's paintings? Have you ever painted wet over dry? Where it was not possible, practical, or simple enough to paint wet on wet? Will you offer the option of purchasing Geneva colors without the oil of cloves being added for people who want their paint to dry quickly? You teach using a limited palette to create an extensive palette of color groups, but this seems like it could create certain problems, like wasting paint or having to remix colors you run out of. What are your thoughts on these issues? How do you get out of a painting slump? Do you build your own paintbrush holder? Could you do a varnish demonstration? How can you fix a burnt umber that tends towards grey? Can you fix it with burnt sienna? What kind of light bulbs do you use while painting? And why does the color temperature matter? How long before we can buy a color checker from you? In your "How to Mix Colors" video you talked about good step versus bad step? Could you elaborate on what you mean by this? What is dangerous about paint fumes, and how do ventilate in the middle of winter or summer when you can't open a window? I'm having trouble painting fabric. Could you please help? I enjoy painting thickly with painting knives. Can I use thickening agents like cold wax medium with Geneva paints? Can you explain what you meant by "leveling paint" in your recent video "The Benefits of a Limited Palette"? What do you think about the progression of Rembrandt's work as he matured and aged as a painter? Tell us about your art educational background, both formal and informal. Will Geneva paint be coming to stores? Will Geneva make canvases? Do you have any tips on tonalism? How to start a painting, colors and composition, etc? I used to paint dark values to light values, but now I paint from top-left corner to bottom-right. How do you cover your canvas? Can you be successful using only high-quality photographs as a source for painting realistic portraits? When working on large paintings, do you ever mix and paint some portions of the painting, finishing those before mixing colors for the rest? How do I get an honest opinion on the quality of my paintings from knowledgeable professionals such as yourself? What is the best way to store oil paintings? What is your favourite painting you've made? I don't care to learn without the method, I just want to make money. Will people consider me a "cheater" if I match colors for an entire career? Did you use the "method" for all the portraits on markcarder.com? How do I paint layered intricate patterns with Geneva paint? What is your opinion on standing versus sitting while painting? Do you ever use a mahlstick or cane? Would you paint from a print that has been "amped up" with filters in Photoshop? Does the fluidity of Geneva paint still allow for brush strokes to show in paintings? What sort of black do you use for painting your easel and color checker? Could you go into detail about what makes a strong composition? Is it possible to mix Naples Yellow with the Geneva palette? When doing master studies, how can you consciously learn something instead of just mindlessly copying? How do you set prices for artwork? What do you think about galleries getting 50%? Do you have any tips for using Geneva paints outdoors for plein air painting? How does using walnut oil as a medium affect paint? How do you paint with a dirty brush (not fully cleaning your brush while moving around the painting)? Could you explain the technique of mixing a yellow other highly saturated color? When working in three or more layers, should I thin the first layer with solvent? Do you always mix your own black? What is the burnt umber to ultramarine blue ratio in your Geneva Black? How do I proceed when a painted object in my unfinished painting has dried? When can I re-oil areas of the unfinished painting that have become matte? 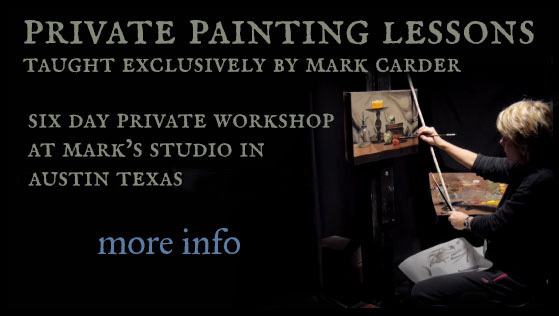 Will you be offering a video or workshop teaching us how to paint horses? Regarding the fat-over-lean rule, do your Geneva oil colors contain more oil, less oil, or about the same amount of oil as standard tube paint? 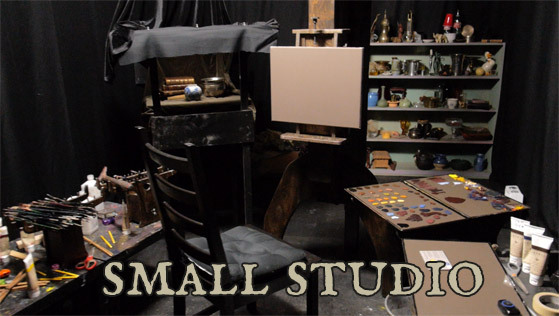 When you talk about having a dark cloth hanging behind you in your studio, do you mean behind your easel, or do you mean a dark backdrop behind your back? Please share your ideas about color blindness and painting. What is the best approach to "wean" oneself from color checking? Can Alizarin Crimson be mixed with Cadmium Red Deep and Permanent Rose paint? Is drawing a talent or something that can be learned? What other forms of art have you experimented with and which was your favourite? How do you adhere to the fat-over-lean rule with Geneva paint? In warm climates how do you keep paint from drying too fast during the summer? And how do you keep glare off the color checker? How did you work your way up to painting the president? 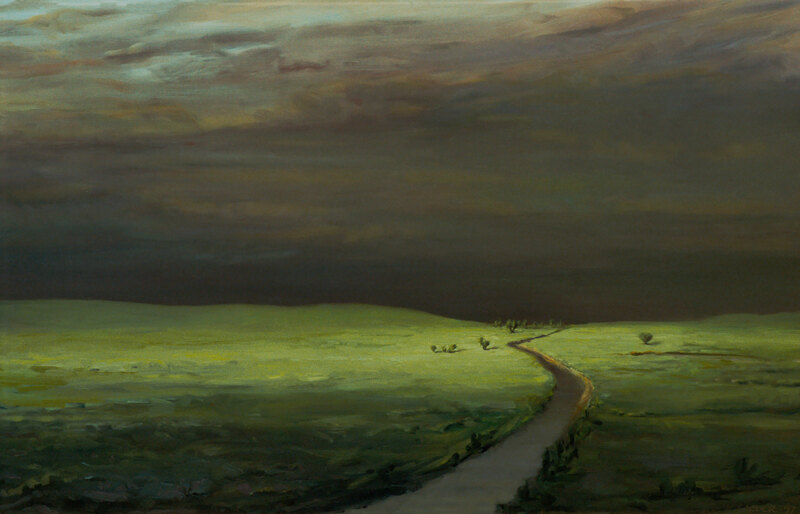 Why are your landscapes painted more loosely than your portraits? What are the most important tips for artists beginning their career? What happened to all the peacocks that were constantly interrupting you during the filming of the original Carder Method video series? Why do you sell Geneva paint in jars as opposed to tubes? Have you ever tried acrylic paints and why do you prefer oils over acrylics? Does painting in acrylics also improve your skill in oils, or is there a big difference which keeps you limited? Do you still work on paintings for exhibitions/commissions/personal projects? Can you put up a time lapse of a finished painting? Do you size or use acrylic gesso? Have you ever gotten into alla prima painting? Do you need both a cool and warm of each primary to paint landscapes? When working from photos, can you use glass or acetate instead of laminate? Is painting in layers and glazing with Liquin possible with your paint? What are shipping costs to Belgium? Can we see your first painting? Would you be able to do some tutorials regarding portrait and figure work? What do you do about dust or lint? Is there a slow drying medium formula that doesn't have stand oil or Venice turpentine? Can you tell us more about your studio furniture line that you have planned?